In just the past two years, British pop singer/songwriter Anne-Marie has emerged as a popular and acclaimed artist in the U.K. and Europe, releasing a string of singles that have become chart hits. In addition, she is now building a strong following in the U.S.. having two hits and touring across the country this summer as the opening act for Ed Sheeran’s North American stadium tour. Anne-Marie combines a powerful singing voice with a charismatic, exuberant personality. She has released confident, catchy anthems that have a female-centric message. 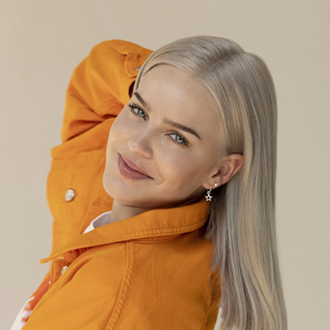 Anne-Marie is best known for her worldwide hits “Rockabye” (the Clean Bandit single where she was featured) and “FRIENDS,” her duet this year with Marshmello. It was in April (2018) that Anne-Marie released her debut album Speak Your Mind (on Warner Bros. Records), that not only contains these two hits, but several songs that were hits in the U.K., Europe and Australia. She’s currently on the charts with her single “2002,” a vibrant, reflective tune that she co-wrote with Sheeran. Other hits included on her album is the fun, feisty single “Ciao Adios” and her 2016 song, “Alarm.” Impressively, Speak Your Mind has been certified gold by the RIAA, and her hit “FRIENDS” has been certified platinum. In addition to these singles, Anne-Marie is featured on the new single by David Guetta, called “Don’t Leave Me Alone.” Then later this fall, she’ll be releasing another single from her album. Regarding her live performances, Anne-Marie has been getting massive exposure by touring with Sheeran on his North American stadium tour. Also importantly, she’s had a chance to be the headliner, playing select shows in smaller venues. For instance, she recently opened for Sheeran at the Rose Bowl stadium in Pasadena, CA, and then played a sold-out headlining show at the historic rock club, The Roxy. We are pleased to do this new Q&A interview with Anne-Marie. She talks about her hits “FRIENDS,” “Rockabye” and “Ciao Adios,” her songwriting, plus her extensive touring in the U.S.
DK: Two years ago you had a big hit, “Rockabye,” with Clean Bandit. How did you connect with Clean Bandit for this song? Anne-Marie: We were on the same label in the U.K., and I saw them around the festival season, and obviously their music is really good. I heard “Rockabye” and absolutely fell in love with it. It’s such an incredible song—the fact that you can just dance to it and sounds really fun, but then the actual subject is about a single parent loving their child…it just blows my mind. I think more subjects like that need to be spoken about in music. “Rockabye” is an upbeat, amazing song, yet it’s very emotional, quite a sad song. So I love the juxtaposition between those two things, that you can put a really upbeat tempo with a very emotional, sad song. DK: Last year, you had a hit with your song, “Ciao Adios.” Can you talk about writing this song? Anne-Marie: Yeah, I wrote that in L.A., and I think that comes through on the vibe of the song. The song’s very summery and it makes you feel happy. I always write about real experiences that I’m going through at the time. So when I was writing this song, I was trying to find the courage to say goodbye to somebody who I was with, who just wasn’t good for me. It was a really hard process for me to go through. I think the song helped me get through it, and that’s my aim when other people hear the song as well…to find the courage to say goodbye to someone who isn’t good for them or it’s not working out. DK: This year, you had a worldwide hit with “FRIENDS,” that you did with Marshmello. How did you get together with Marshmello and write this song? Anne-Marie: Well, Marshmello remixed my song called “Alarm” back in 2016. And I always loved the remix that he did, but I’d never met him. So luckily, he was in London last November (2017). We went to the studio, but it wasn’t meant to be a writing session. It was just meant to say hello and meet him, and say thanks for that remix. He had his laptop out and he was playing a few bits, and there’s this one guitar instrumental that he made, and I just was like, “I need to write to this song right now.” And we did it and recorded it in three hours. When I write songs, I want to write stuff that I haven’t heard before. So I try to do that, or twist the song so it’s not just a love song, or it’s not just a breakup song. And I always think “FRIENDS” is quite funny, with the friend zone situation. That’s when you’re hanging out with someone and you see them as just a friend, but they obviously see you in a different way (more romantic). And you tell them that it’s not gonna happen. But they still keep trying and that’s when you have to put them in the friend zone, which is quite awkward. So I think when people don’t get the hint, you need to give them something extra. And I thought that with this song, people could send this song to someone who doesn’t get the hint (laughs). DK: Currently, you have hit called “2002” that you wrote with Ed Sheeran. Can you talk about how you wrote this song? Anne-Marie: Ed and me are really good friends…we’ve known each other for nearly 10 years now. I love him, and I always wanted to get into the studio with him. But we were always in different countries and traveling around the world, so it was impossible until this one time when we were both in London again. Ed had this whole idea for the song, and he’d written it with Julia Michaels [and other writers]. And I went to his studio and wrote the rest of the song with him. It was a great experience, because you fall into your own little ways of writing a song, and when I met Ed in the studio, it was the first time I had that experience of writing in the studio with him. He really taught me to not be scared, to let go and just say whatever comes into your mind. And that’s what I think I’ve had trouble with…I always have to make sure it makes sense in my head before it comes out of my mouth. I think that stops a lot of ideas coming out, and when I got into the studio, he would ask, “What about this?” Or, “What about this line?” And it just opened me up to not being scared, to just say whatever comes into my brain. We had a great time, and obviously the best songs come from sessions where you’re most comfortable. It was just great to be in there with a friend. DK: You also have a new single with David Guetta called “Don’t Leave Me Alone.” How did you connect with David? Anne-Marie: I got a phone call from David, and he said, “I’ve always wanted to do a song with you.” And I was like, “Whoa!” That was amazing, because when I was younger, I’d always wanted to do a song with him, but back then (years ago) he didn’t know who I was. So that was amazing, getting the phone call from him. DK: Currently, you’re on a big stadium tour in the U.S. with Ed Sheeran. How’s the tour been going, and what’s it like performing in front of such huge crowds? Anne-Marie: Yes, it’s crazy…I really love it. I love going out there every night and seeing so many people. It’s quite scary…I’m a very nervous person (laughs). So when I first go onstage, it’s very different from when I finish, because my confidence grows and [doing these shows] teaches me a lot about confidence, and how to deal with a crowd like that. I’m also doing my own headline tour in the U.S. at the same time. So on the days off, I don’t actually get days off. I’m doing my own headline tour. It’s a very big difference from the stadium shows with Ed, to doing my own shows in intimate little venues. DK: How have your headlining shows been going? Anne-Marie: They’ve been amazing. I really love small venues like that, because you can just feel everyone, and you see every single person’s face. You can really talk to them, just like you’re talking to your friends. The L.A. show at The Roxy was incredible. It was sold out and it was really hot…everyone was sweaty. I loved that show. DK: In addition to your own single “2002,” plus “Don’t Leave Me Alone” with David Guetta, is there another song from your Speak Your Mind album that you’ll be releasing as a single? Anne-Marie: Yeah definitely. I’m not quite sure what song will be next. Well, I might be sure but I’m not allowed to say (laughs). But I’m very excited about releasing a new single from my album. DK: You’ve been busy on tour in the U.S. Have you had a chance to do more writing, with Ed Sheeran or other writers? Anne-Marie: Yeah, we’re gonna try to get into the studio again with Ed. I’ve also been writing a little bit on the days off. I’ve been in L.A. and I’ve written a few songs. It’s just exciting to get back into the studio again. When you’re on tour, it takes up so much time, and your head starts to expand with ideas and nearly explode sometimes. So it’s really amazing to get back into the studio, and that’s where I’m most comfortable. It’s just great to have that time, to get to be in the studio.